"A significant contribution to the continuing exploration of the issues surrounding the learning potential of young children's play. Holland's writing is engaging, her subject is of considerable interest, and her approach succeeds in challenging many of the taken-for-granted assumptions in several areas of the debate. Early childhood educators, those preparing to become early childhood educators, and those who accompany them on this journey will find much that is worthwhile and provocative in this book." Discourse"This book will be a valuable support to all practitioners who do not enjoy 'policing' children's play themes." Nursery WorldWar, weapon and superhero play has been banned in many early childhood settings for over 30 years. This book explores the development and application of a zero tolerance approach through the eyes of children and practitioners. The author challenges the key rationale for linking aggressive play themes to violent behaviour. She examines play where children are allowed to construct weapons and enact goodies/baddies and superhero scenarios with sensitive adult guidance, and explores the generally positive experiences of children and practitioners. 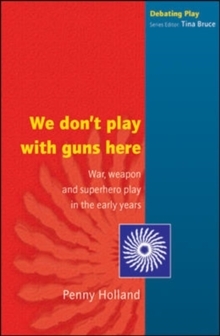 Rather than reading this form of play as the beginning of the slippery slope towards anti-social behaviour, readers are invited to view it as an entry point to imaginative play and social development.We don't play with guns here is a fascinating and insightful contribution to this area of much debate in the early childhood community. The book is key reading for early childhood practitioners, teachers, students, parents and policy makers.